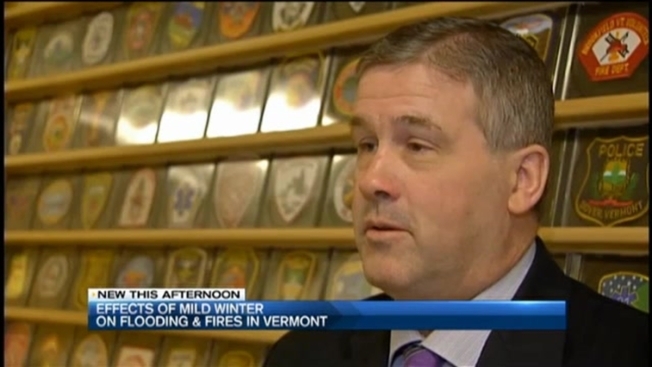 What Does Weird Winter Mean for Vermont’s Flood & Fire Risk? Vermont is at a below-normal risk of spring flooding, but could face an earlier and possibly more severe brush fire season, the Burlington office of the National Weather Service said Monday. Both situations are due to Vermont's weird winter, which has seen above-average temperatures and below-average snowfall, Scott Whittier of the National Weather Service explained at a forum on flood preparedness hosted by the Vermont Division of Emergency Management and Homeland Security. Whittier said the March 13 snow depth at the stake on Mount Mansfield was 26 inches, compared to the normal 72 inches for the date. There is also less ice in rivers across Vermont than communities typically see at this time of year, he noted. Those factors should combine for a below-normal risk of spring flooding. "Heavy rainfall and the weather that happens between now and through April are the keys," Whittier said, pointing out that severe rain storms, especially if there are multiple storms, could still create conditions that may spark flooding. In late February, ice jams did cause flooding, road closures, and even evacuations in some Vermont communities, including Lyndonville. For that reason, emergency management officials said cities and towns always need to anticipate possible problems, and know what resources are available. "Hopefully we won't have a bad [flooding] year this year, but the weather can change in Vermont any time," said Chris Herrick, Vermont's emergency management director. Pathetic snowfall totals this year in Vermont have left dry fuel in the underbrush on roadsides and in the woods, Whittier pointed out, warning that could set the stage for wildfires until the vegetation greens up. The Williston Fire Department has already outfitted its brush firefighting truck, a pickup which holds hand tools and water-filled backpacks, and is more capable of traversing backwoods conditions than a larger fire truck would be. "I, personally, do not remember the last time we had it going this early," said Prescott Nadeau of the Williston Fire Department, describing how the department already has its brush unit on standby. "With the lack of snowfall we've had, and the dry vegetation, it can lead to a potentially dangerous brush fire season coming up." Because of what it sees as a heightened risk for brush fires, the Williston Fire Department is reiterating the importance of following backyard brush burning rules and obtaining a proper brush burning permit. The weather emergency preparedness forums continue throughout this week, and will include presentations from the National Weather Service, state emergency management leaders, regional planning commissions, the Vermont Agency of Natural Resources, and the Vermont Agency of Transportation, organizers said. The forums run from 10:00 a.m. to 12:00 p.m. and will allow time for questions, according to the Vermont Division of Emergency Management and Homeland Security. Vermonters who want to receive information about emergencies happening near them, such as flash flooding or a fire that has forced evacuations, can sign up for customized emails or text message alerts through Vermont Alert, a free service. For more information on enrolling in the alerts, visit the website.